Another chance to get to know us! It has been another great Quarter and we appreciate all of our customers. 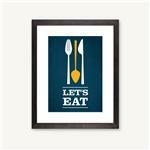 Please join us for lunch December 19th and 20th between 11:00 AM and 3:00 PM. We apologize, the previous newsletter was sent with incorrect dates. Please update your calendar and join us on the 19th and 20th. Balancing Service Company (BSC) has provided machinery solutions since 1946 serving clients throughout the world by helping them overcome challenging machinery problems. With our staff of experienced technicians and using the latest technology, BSC is uniquely positioned to address your machinery problems form complete vibration analysis of pumps, motors and fans to precision balancing and shaft alignment services. We have a solution that will give you "peace of mind." Premier Pacific Seafoods is refitting the main engine in their fish processing vessel, the M/V Excellence. The original 1973 vintage engine is being replaced with a modern 12 cylinder General Electric Diesel engine and reduction gear box to improve the fuel consumption of the vessel. BSC was retained to perform the laser alignment of the gear box, engine and propeller shaft. The propeller shaft in the M/V Excellence is mounted in fluid film bearings. Fluid film bearings support the rotating shaft on a very thin film of oil. The thickness of the oil film is controlled by the radial load, speed of the shaft, and the bearing design. The location of the shaft in fluid film bearing changes with load and speed. In order to accurately determine the location of the new gear box and engine relative to the existing propeller shaft, the location of the propeller shaft under load in the fluid film bearing must be known. In order to measure the location of a rotating shaft a non-contact measurement technique is required. Because the dynamic displacement of a rotating shaft in a fluid film bearing is very small (on the order of 0.001 inch or 1 mil), the dynamic resolution of the non-contact measurement system must be a fraction of a mil. High precision inductive eddy current sensors are one non-contact measurement system that can measure the dynamic displacement of a rotating shaft to a fraction of a mil resolution. In order to determine the vertical and horizontal location of a rotating shaft two measurement locations are required. Two sensors located perpendicular to the shaft center line and spaced 90 degrees apart in the radial direction on the bearing housing will determine the location of the shaft center line. In addition to the location of the shaft, the two sensors located 90 degrees apart can provide a wealth of information about the dynamic behavior of the fluid film bearing. This measurement technique is a standard approach for monitoring the health of a fluid film bearing and provides diagnostic capabilities for trouble shooting problems with rotating machinery. monitoring rotating shafts using non-contact precision inductive eddy current sensors is one of the advanced measurement capabilities offered by BSC and their strategic partners. 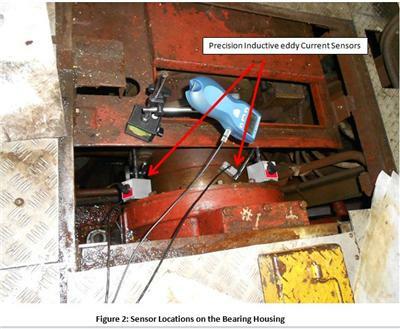 In order to measure the location of the M/V Excellence's propeller shaft position relative to the bearing housing, BSC mounted two precision inductive eddy current sensors on the bearing housing just aft of the main engine. 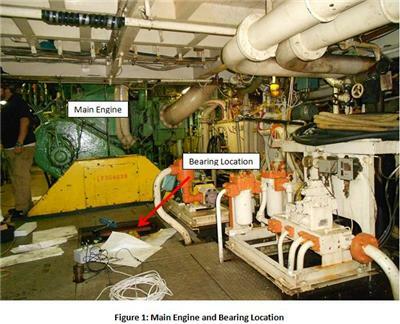 Figure 1 shows a view of the main engine and the location of the bearing. Figure 2 shows the location of the sensors used to measure the dynamic displacement of the shaft. The displacement of the propeller shaft was measured with the propeller providing forward and reverse thrust. Because the M/V Excellence was moored to a pier during the measurements, the duration of the forward and reverse thrust was limited to a relatively short period of time. The displacement of the propeller shaft was stable and constant for both forward and reverse thrust. Figure 3 shows the displacement of the center of the shaft rotating relative to the center of the bearing. The measured position of the propeller shaft under thrust load will be used in calculating the location of the new engine and gear box. One of BSC's certified alignment specialists will employ the latest laser alignment technology to precisely position the gear box and engine in the proper location to connect with the propeller shaft in order to ensure the reliable and trouble free operation of the new main engine of the M/V Excellence. For more than 60 years, BSC has served its clients throughout the world by helping them overcome challenging machinery problems. BSC uses the latest laser alignment technology to provide the highest accuracy alignment of rotating equipment shafts to meet today's ever-tightening tolerances. In addition to the laser alignment, BSC and their strategic partners' capabilities include machinery dynamic measurement and diagnostics including vibration measurements and modal analysis, shaft torsional analysis, and other advanced machinery measurement and analysis capabilities. Please contact us for your challenging machinery problem. We are pleased to announce that in February 2013 one of our Certified Analysts is re-locating to the Portland/Vancouver area. Balancing Service Company knows that saving money and a quick response time are very important to your business. We will now be in a position to offer our same high quality service with reduced travel costs and better lead time. Tasks: Service and equipment sales, electronics and low voltage electrical systems repair and wiring, shop and field equipment calibration and inspection, shop and field dynamic balancing, laser sheave alignment and laser shaft alignment. Manage all south end business. (Oregon/Longview) scope. 2008-2012 US Navy Aviation Ordnanceman 2nd Class, trained and supervised command in use of all types of ordnance equipment from large caliber guns, to missile systems and small arms. In charge of units stowage, requisition, issuance, and reclassification of explosives. As the calibrations/repair parts officer, made mechanical, electrical, and electronic casualty analysis using technical publications, circuit diagrams, and blueprints. Serviced and customized hydraulic and pneumatic systems; repaired, maintained, tested and calibrated microprocessing equipment. Maintained Top Secret Security Clearance that is valid through March 2018. After working in the Navy, Dale worked and was trained in professional sales as an executive recruiter before coming to BSC and worked in the health and fitness field on filling positions for large health companies that were VP, Director-, or C-Level and above. July-August 2012- BSC in shop training consisted of dynamic balancing of equipment for various companies to ISO or MIL-SPEC tolerances. September 2012- 8 hours of Mobius I-Learn Interactive Level I (Vibration Technician) Vibration Analysis/Collection and reporting software training. 120 hours field training. October 2012- 90 hours shipboard training for data collection and proactive maintenance reporting as well as an additional 16 hours of Mobius I-Learn Interactive Level II (Vibration Analyst) Training. November 2012- Assessed by certified technicians in Laser Shaft Alignment, Field Balancing, Loading Data Collectors, Collecting Data, and Downloading Data to Backup Drives.